Case LCase(Item.Subject) Like "*" & word & "*"
MsgBox "Please, do not swear in the subject! 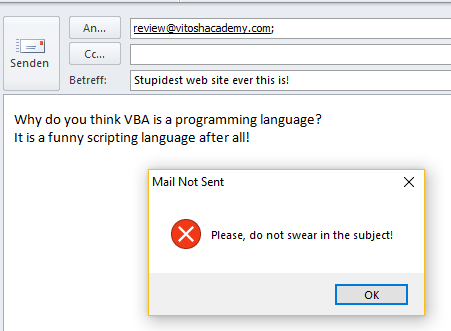 ", vbCritical, "Mail Not Sent"
Case LCase(Item.Body) Like "*" & word & "*"
MsgBox "Please, do not swear in the body! ", vbCritical, "Mail Not Sent"
MsgBox "Email is not sent! ", vbCritical, "Mail Not Sent"
At the end, you get a message, asking you to confirm whether you are willing to send this email or not, although none of the bad words was found. In case that no is selected for an answer, the email is not sent. If you have noticed that MsgBox is used once with parenthesis and once without and you realized why this is so, you may pat yourself on the shoulder! Good job! For everyone else, keep in mind that the MsgBox with parenthesis is a function, which returns a value, equal to vbYes or vbNo in the second Select Case part of the code.